British scientists say they have created human embryos containing DNA from two women and a man in a procedure that researchers hope might be used one day to produce embryos free of inherited diseases. Though the preliminary research has raised concerns about the possibility of genetically modified babies, the scientists say that the embryos are still only primarily the product of one man and one woman. "We are not trying to alter genes, we're just trying to swap a small proportion of the bad ones for some good ones," - said Patrick Chinnery, a professor of neurogenetics at Newcastle University involved in the research. The process aims to create healthy embryos for couples to avoid passing on genes carrying diseases. The genes being replaced are the mitochondria, a cell's energy source, which are contained outside the nucleus in a normal female egg. Mistakes in the mitochondria's genetic code can result in serious diseases like muscular dystrophy, epilepsy, strokes and mental retardation. In their research, Chinnery and colleagues used normal embryos created from one man and one woman that had defective mitochondria in the woman's egg. They then transplanted that embryo into an emptied egg donated from a second woman who had healthy mitochondria. The research is being funded by the Muscular Dystrophy Campaign, a British charity. Only trace amounts of a person's genes come from the mitochondria, and experts said it would be incorrect to say that the embryos have three parents. "Most of the genes that make you who you are are inside the nucleus. We're not going anywhere near that." - Chinnery said. 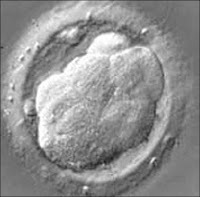 So far, 10 such embryos have been created, though they have not been allowed to develop for more than five days. Chinnery hoped that after further experiments in the next few years the process might be available to parents undergoing in-vitro fertilization. "If successful, this research could give families who might otherwise have a bleak future a chance to avoid some very grave diseases," - said Francoise Shenfield, a fertility expert with the European Society of Human Reproduction and Embryology (ESHRE). Shenfield was not connected to the Newcastle University research. Similar experiments have been conducted in animals in Japan, and has already led to the birth of healthy mice who had their mitochondria genes corrected. Shenfield said that further tests to assess the safety and efficacy of the process were necessary before it could be offered as a potential treatment. A bill to allow the procedure to be regulated as a therapy for couples — once it is proven to work — is expected to be discussed in Britain's House of Commons in March.